Question: What can a writer learn from an illustrator? Answer: The fact that we don’t have to know the entire plot before we begin. Indeed, we might know nothing at all about our story but if we have a strong ‘hunch’, it’s important that we follow it. Earlier this month my daughter and I attended a talk at the Richmond literature festival with the author/illustrator Ian Beck. 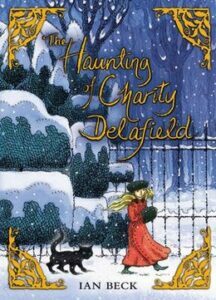 Beck was there to talk about his new novel The Haunting of Charity Delafield. I had expected the talk would be more interesting to my daughter than to me, but I was wrong because as Beck described his working process, I recognised it as the same process I use when I write novels myself, the same process that I recommend to clients time and again: the organic method of development. Beck was, in the first instance, an illustrator, having trained at Brighton College of Art in the sixties, where one of his tutors was Raymond Briggs. After working as an illustrator for magazines and in the recording industry for several years (his work included the album cover for Sir Elton John’s ‘Goodbye Yellow Brick Road’), he moved into children’s book illustration in the ’80s. More recently, he has written novels for children and young adults. ‘Stories can begin in all kinds of odd places,’ Beck said. ‘The important thing is knowing how to recognise it.’ It was three years from the time of that first illustration to the completion of the novel. It’s clear you can’t rush an organic project. Beck has a shed in his garden where he writes, but he’s equally comfortable scribbling for half an hour in a coffee shop. He believes it is vital to be ‘open to imagination, allowing things to happen’. His early influences were illustrations such as Pauline Baynes’ image of Mr Tumnus in Narnia, and books such as The Borrowers and Dr Dolittle. He admires the work of Arthur Rackham, Edmund Dulac and Harold Jones in Lavender’s Blue: A book of Nursery Rhymes. I didn’t ask the question ‘but how did you work out the plot?’ Why? Because as an organic writer myself, I understand that when we begin with character, setting, relationships, questions – the plot emerges as part of the process. Of course, different writers have different methods of developing plot and I do not underestimate the importance of a good structure in a book. One of the reasons I always advocate organic growth is because I believe that when characters are fully realised, they end up doing things that we don’t expect them to do. The more we write about them, the more we understand them and all of our best-laid plans can go awry. I will write about ‘good plot structure’ in a subsequent post. But I highlight Beck’s method of starting with an image or a hunch, even if you don’t know where that will lead you, because I am deeply aware of how many authors are held back by a sense of ‘not knowing’ where a novel is going. Whereas ‘not knowing’ can be the powerful thing. ‘Not knowing’ is, so often, what the creative process is all about. We have to be brave and we have to face the blank page and we have to recognise that there is mystery in the creative process. If we are to produce our best work, we must remain open to uncertainty. You can find out more about Ian Beck and his earlier ‘Tom Trueheart’ novels on his website here. If you’re interested in the organic method of writing, my ebook Get Black on White offers a simple introduction. Or do sign up for the newsletter on this website for regular fortnightly advice and motivation on the writing process in your in-box.